Yeoal's Blogzine™| Nigerian Urban, Gossip and Entertainment Site: Tiny Harris Dumped T. I for Master P? Tiny Harris Dumped T. I for Master P? Remember your auntie told y’all that Tameka “tiny” Harris had a new new man who was paying all her bills and dropping bags and baguettes on her while T.I. chased tail in Cali? Well, after sitting on this secret for nearly 2 years, I can finally reveal who he is. 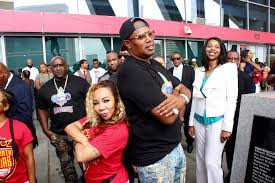 Tameka’s man is none other than New Orleans rap mogul Master P! Master P dotes on Tiny and gives her everything she can’t get from her estranged husband. He gave Tiny a new house, and now he just gave the mother-of-5 her own basketball team in the new mixed gender league!